Although the Pennsylvania Avenue is a major street in the District, most people do not know that the District Department of Transportation (DDOT) has limited control over how it is maintained, its designed or what amenities are situated along it. While Congress may exercise its control, Pennsylvania Avenue has several entities that have some authority over the street. Many of them will be at the Pennsylvania Avenue Plan public meeting, Wednesday, May 29 to discuss the future of the street and who will be responsible for its long-term planning. The government participants will include the National Park Service (NPS), the National Capital Planning Commission (NCPC), General Services Administration (GSA), and the District of Columbia. The meeting will be from 5:00p to 7:00p at NCPC’s offices, 401 9th Street, NW. The meeting will give bicyclists and the public a forum to discuss potential alternative for Pennsylvania Avenue and how it will serve visitors, residents and commuters. The meeting will also address the jurisdictional ambiguity regarding maintenance and overall control of the street, which includes the Commission on Fine Arts (CFA) and law enforcement entities, NPS, and DDOT. 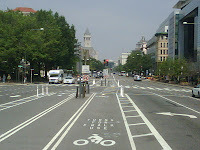 As a primary corridor, bicyclists have requested that the bike lanes on Pennsylvania Avenue have protective bollards and other items like green paint and bicycle signalization to prevent motorists from performing u-turns or additional structures to help bicyclists safe. NPS is using information gathered at this public meeting to prepare the Pennsylvania Avenue National Historic Site Environmental Assessment (EA), which will address how the street can become more inviting and serve as a ceremonial boulevard. As a historic street, NPS must also comply with section 106 provisions of the National Historic Preservation Act (P.L. 108-72), which requires federal agencies to consider the effects of their actions on cultural resources that are on or eligible for the National Register of Historic Places. The meeting will address both of these issues. The EA will potential update the Pennsylvania Avenue Development Corporation (PADC) plans, which are documents that evaluate the economic and structural development of the street. The PADC was established by Congress in 1972 and published its first plans in 1974. According to the NPS website, the redevelopment plan for Pennsylvania Avenue was essentially completed in 1996 and the PADC was abolished. Congress authorized the GSA, NPS, and NCPC to manage the street in its place. The initial plan describes commercial, residential and transportation structures along Pennsylvania Avenue and the adjacent area. The plan also provides for the use of bicycles along the street. 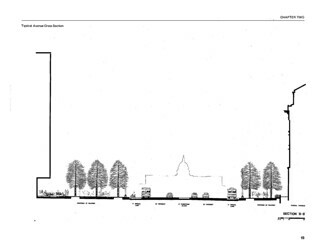 Typical Cross Section of 1974 Pennsylvania Avenue Plan contains provisions for bicycles. Courtesy Pennsylvania Avenue Development Corporation (Page 18). Click for a larger view. Specifically, page 59 of the vehicular circulation plan section called for "two 11-foot outside, and, if traffic conditions permit, reserved for exclusive bicycle and bus use". "...signs, signals, street furniture-includes the cost of replacing and installing new identification and direc­tional signs throughout project; new vehicular, bicycle, and pedestrian signals throughout project area; and new benches, recreational tables, bike racks, drinking foun­tains, kiosks, and other street furniture". 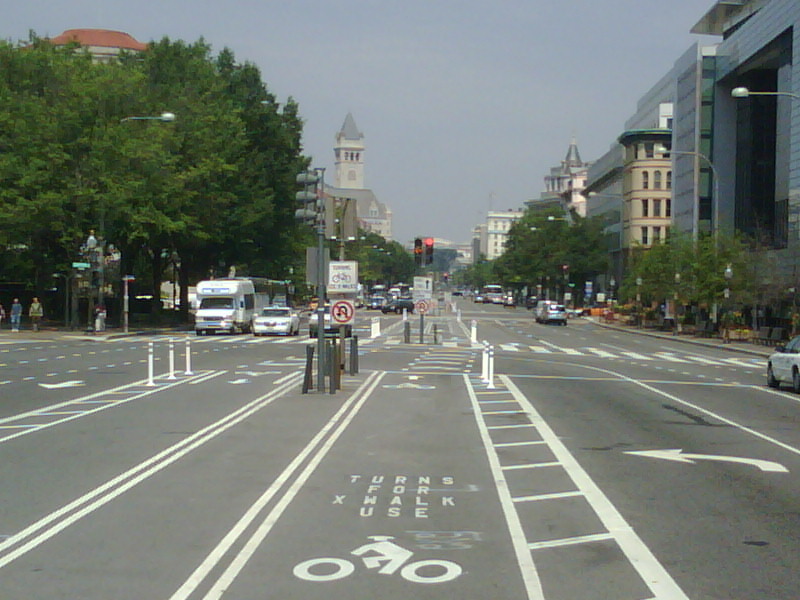 It is important that bicyclists share their concerns about Pennsylvania Avenue. If you are unable to attend the meeting, NPS also will provide for an opportunity to comment of the suggested alternatives as they become available. Please feel free to leave your comments below.